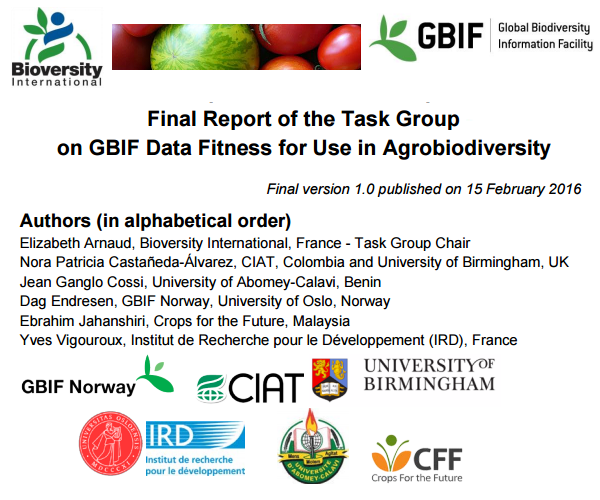 A team of international experts of Agrobiodiversity Task Group of the Global Biodiversity Information Facility - GBIF compiled recommendations that are now published as the final Report on GBIF Data Fitness for Use in Agrobiodiversity on GBIF web site! The discovery, sharing and use of relevant data - an approach increasingly used for content analysis, distribution modeling and decision-making - is critical for every research field, comprised global biodiversity. To tackle the issue of improving quality and usability of data in biodiversity, the Global Biodiversity Information Facility - GBIF (an international open data infrastructure, funded by governments in 2001) has established itself as an essential infrastructure underpinning science and policy related to biodiversity information that should be “freely and universally available for science, society and a sustainable future” (GBIF's vision). This is demonstrated by the growing volume of peer-reviewed research using data discovered and accessed through GBIF. The Secretariat maintains an active and ongoing programme to identify and tag GBIF-relevant research in the scientific literature, and a complete searchable archive of all citations is freely available through the Mendeley GBIF Public Library. To explore the best way to improve the use and application of GBIF-mediated data in agrobiodiversity and distribution modeling, the GBIF has assembled a pair of GBIF task groups of international experts. Each task group is asked to assess coverage and completeness of data - often referred to as ‘fitness for use’ (as being ‘data quality’: accuracy, completeness, update status, relevance, consistency across data sources, reliability, appropriate presentation, accessibility) - and lend its expertise to recommend approaches able to improve research and applications in a number of science relevance areas. The work of each task group is part of a broader strategy to engage expert communities of interest to understand how biodiversity data are applied in particular use cases, how to apply methodologies for using GBIF-mediated data, as well as to mine and develop data applications using the GBIF data infrastructure in a growing number of projects and online tools. GBIF task groups are consulting with other experts in order to gather opinions, share insights on data publishing and use, to document best practices for agrobiodiversity or distribution modeling uses, as well as to provide recommendations to enhance GBIF.org to support user needs. worked hard in 2015 to compile recommendations that are now published as the final Report of the Task Group on GBIF Data Fitness for Use in Agrobiodiversity. "The conservation of agricultural biodiversity cuts across the disciplines of natural resources management, ecology and agriculture, so research requires open access to quality data from various domains… The task group’s recommendations provide a concrete road map for improving accessibility and quality while enhancing the usefulness of GBIF-mediated data. We hope they will help the scientific community fill data gaps and remove remaining obstacles to access," said Elizabeth Arnaud, chair of this task group. GBIF’s Task Group on Data Fitness for Use in Agrobiodiversity assembled its recommendations following a survey, in-depth interviews of other experts and a public consultation and feedback on GBIF mediated data. The report provides more than 50 recommendations for enhancing the data flow from data coverage, completeness, publishing to usefulness and use of GBIF-mobilized data for research in agrobiodiversity, also considering the role of the nodes in data mobilization and the promotion and training actions. Train the GBIF Nodes in the mobilization of relevant data types useful for crop improvement and for landscape restoration. One section offers examples of real uses of data in agrobiodiversity research. The recommendations were recently discussed during the Biodiversity data quality symposium, in São Paulo, March, 8th, 2016. GBIF’s Task Group on Data Fitness for Use in Agrobiodiversity encourages the community to submit use cases using the template available on this page. Filled templates may be sent to Dmitry Schigel, GBIF Secretariat (dschigel@gbif.org) - Programme Officer for Content Analysis and Use.